Christmas is right around the corner, some people have developed the tradition of an Advent calendar. While these are easily accessible in stores which include a chocolate for each day, there are other options which will last year after year. Story Time Felts makes two different products to keep track of Advent, to either start your family on this wonderful tradition or to make sure there is always one on hand. The first option is a Christmas Tree Advent which includes twenty five figures to be placed on or under the tree and decorate the house. Literature is included allowing children to learn what the different Christmas symbols mean. 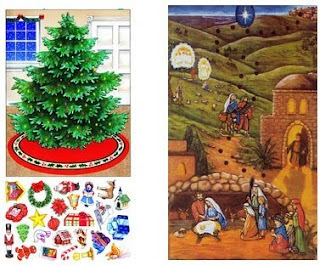 The second option is an Advent Calendar displaying Mary and Joseph winding their way to Bethlehem. Once in Bethlehem Utilize the nine figures which include the wise men, shepherds, baby Jesus, Mary and Joseph to tell the story of Jesus’ birth. The backgrounds are unmounted and Velcro dots are included to mount the figures onto the background. I suggest purchasing a medium sized dowel and some festive cording to mount the background to. You can then use a hot glue gun to mount the background to the dowel then tie both ends of the cording around the dowel to hand from a door knob or a cabinet door. You want to be sure where you decide to put it there will not be a lot of disturbance. Other ideas include a nail unused, a hook use your imagination and you will find the perfect stop. Click on the Christmas link to view these items.